Question: How can an attribute that is totally opposite to the will to enjoy and seems to be killing it nonetheless unfold in it? Answer: If it were two types of matter, matter and antimatter, then it would be impossible to unify them indeed. But if it is matter and an opposite intention to it, then it is possible. Besides, it gets revealed to me on condition that I will manage to unify them in the middle line. Therefore, my natural desire to enjoy and the intention to bestow work in two different areas: one in desire, the other in intention. And all my calculations and struggle are aimed at how to bring them together. Suppose I have the desire to enjoy that I live in. In addition to it, I receive the intention to bestow, which could be either below the will to enjoy, or at the same level as the will to enjoy, or above it. Now I need to somehow connect them together. Pertaining to intention, I acquire it only by way of the “Light that Reforms,” the Surrounding Light. I draw it if there is an aspiration for bestowal within me, the “point in the heart” that I cultivate by being in the group. All of this resides within my desire and unifies as one: I, the group, and my will to receive. If my desire remains below, in the degree of its importance, but the group and the point in the heart are above, and from within them I desire to bestow, then I raise a plea (MAN). And in response, I receive the Surrounding Light that supplies the intention to bestow to me. 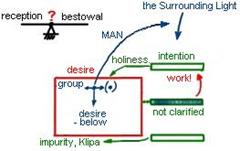 to place the intention above the desire, which is “holiness,” bestowal. That is what constitutes my work: In which of the three states I am able to reside. If a person starts paying attention and feeling what is really happening within him, he will realize that he constantly faces a choice, as if standing between the weighing pans of a scale. On one hand, there is reception; on the other, bestowal. And in the middle, there I am with a dilemma: What should I choose?! Question: Why did we start studying Part 8 of Talmud Eser Sefirot (The Study of the Ten Sefirot) instead of The Book of Zohar? Answer: First of all, we are continuing to study The Zohar daily during the morning lesson, but only for forty five minutes instead of ninety minutes as before. When we read The Book of Zohar, we constantly deal with Partzufim of the World of Atzilut, from which the Upper Governance originates: Arich Anpin (AA), Aba Ve Ima (AVI), Yeshsut, and ZON. Therefore, we must gain an understanding of how they are arranged, what constitutes the hierarchy and relation between them, and what program they are carrying out. Hence, we need to study Part 8 of TES (Talmud Eser Sefirot), which is the major part of The Study of Ten Sefirot, essentially describing the World of Atzilut. Without it, we cannot even come close to The Zohar. Indeed, the more a person knows, the more he understands and acknowledges that in reality he knows nothing, which better enables him to determine his prayer, not a baby’s cry, but a clearly analyzed request. Besides, if we study TES with the same intention that we apply to The Book of Zohar, it affects us and performs the same work in terms of our correction. Question: How many people must hold the intention simultaneously in order for the spiritual connection to get revealed? Answer: Only I. If I uncover my desire to unify with the others, I discover that they are already united. It seems to me that they are not unified in order for me to work on them and them on me. Yet, all of this is in relation to me. It turns out that I must worry only about my own correction. What about the others then? If I see that the world is broken, I have to correct it. This means that I correct myself. In this case, if I treat the others with the intention to bestow, I don’t see them in the broken state. Rather, I see the Shechina (divinity) in them, the revelation of the Creator Who fills the entire world. Question: What can be done if, during the reading of The Zohar, the intention weakens because the mind keeps trying to understand the content of the text? Answer: We shouldn’t pay attention to it. Intention must become increasingly stronger during the lesson since the friends should think about it together. And if each of them holds the intention, it cannot be so that someone drops out of it. Here we truly get connected in the spiritual communication network between us, not in the material one. If I hold the intention to bind myself to “Israel” (those who aim directly to the Creator), the Torah (the Light), and the Creator are one” so that I, the Creator, and the group became as one whole and reveal the Light that fills the entire reality; if all of us strive to experience this condition and, due to reading of The Book of Zohar, the Light has to reveal it to us, then this intention will “burn” in us more intensely. But if I feel that my intention has become weaker, in this, I depend on the all the others 100%. In this respect, we are truly working inside the spiritual network. Thereby, we enter the spiritual world and act in it to the best of our ability to hold the intention and bind “Israel, the Torah, and the Creator” together. We already act this way in the spiritual world and only have to uncover it for ourselves. Therefore, we demand the Light to reveal it to us. How Do You Get Through To The Heart? The matter of creation, meaning us, is the will to enjoy. We cannot make any action unless it is necessary for us to experience pleasure. We only act by the demand of our desire, which is called a “place” (Makom). It is written, “A person learns only in the place where his heart desires,” which means that he learns out of necessity and aspiration. In that case, what is the use of my sitting here and trying to build some kind of intention inside? It’s all a lie. My heart desires something, and I don’t even know what it wants. So isn’t it better to simply read the text, without hoping to get through to the heart? How can we change the desire if we are that desire? In response Kabbalists say: You have to unite and become included in each other, look for the common desire of everyone, strengthen it, and change it. You have to change your intentions and goals with the help of the environment. The rest does not depend on you. Baal HaSulam explains in the article “The Freedom” that when we are included in the group, we “flow” together with it and are influenced by it in every way. However, we accomplish what we want because we start to act by the will of our new desire, which we acquired from the group. Time and time again a person tries to connect to the group and his desire changes. Thanks to this he comes to the study with a different demand and attracts Upper Light that is constantly renewed, which will change him and draw him towards a clear goal and a higher degree. Even if my desire is egoistic, I want all the benefits from this world and from the world to come. I have no care for others and the Creator. However, in the meantime the group around me talks about exalted things. From the spiritual point of view, it’s possible that all of my friends are liars, but they speak eloquently and I am inspired by their speeches. As a result, along with my simple egoistic desire, I unwillingly adopt a new direction toward bestowal from the group. I want to become part of it and I start to value unity. Whether I desire it or not, I become permeated by the values of the group. The friends become a part of me and my intention changes. Now, when I desire the Light’s influence at the study, it obviously comes thanks to the “virus” I received from the environment. I now have something besides my own ego, a new direction towards a goal that I did not desire and could not even imagine previously. The group obligates me to do this. That’s because in our root we are connected into one soul, and therefore, I am permeated by the desires of the friends and they influence me. The group has to “bend” a person, pushing him off the “straight” path to his beloved self, onto the path of bestowal and unity which appears to him like a crooked path. Therein lies the first criterion for making the check: Which values will the group give me? For now we are talking about the values of unity. This is the task that the group must place before me, raising its importance in my eyes. But at the same time, we must understand that there are other goals which the group cannot yet arm itself with and realize in full force. In the meantime, by means of the environment, my intention changes: I think about my own benefit more and more, but I already connect it to the group and find personal benefit in the unity with friends. Then it becomes clear that we do not simply connect to one another, but reveal the Upper One, something spiritual. Now we expect that this will be to our benefit: We will ascend higher and higher up the spiritual degrees. This is already a group intention of Lo Lishma. But after that, we start to slightly think about a true altruistic intention, Lishma, because in reality all our efforts must benefit the Creator. With time we start to have thoughts even of this nature. Of course, we do not want this, yet to some degree we agree to talk about this. Then every person starts to slightly connect to the true goal and to be permeated by it. That is how we go from one state to another, from one “place” to another, from one degree to another, as we improve our desire and its intention which we received from the friends. Gradually we correct our desire, and more than that, our intention. Our intention is the vector we receive from the environment, the direction we take above the desire. Therefore, we have to ensure that the purpose, the goal we obtain from the environment, will constantly change, becoming higher and more important, and becoming truer in our eyes. As a result of all the “intermediate” intentions, we will consolidate together in the group in order to give pleasure to the Creator. Is There Life Without A Screen? The Creator sends us troubles, problems, and all kinds of unpleasant things, while we have to discern the good intention and fatherly love they contain. The Creator is good and does good to the good and the bad. The truth is that everything, including sweet and bitter, comes from the single Force and it’s all for my own good, for the sake of truth. Sweet and bitter sensations are given to me in order for me to aim toward the truth above the bitterness. Then we recognize this Force and start to understand its goal: It wants us to relate to everything in reality according to our intention alone, instead of our sensation. That is how we reveal a new sense – the Reflected Light, Hassadim, faith above reason. In this sense we start to discern the Creator, who sends us all the feelings and situations, while we have to ascend above them by building our attitude to Him above all the sensations. It becomes clear to us that all our work is done above egoism, above the sensations that the Creator creates in our egoistic desire. All of this is necessary only in order for us to develop our intention of bestowal, “truth,” more and more. We will live in this intention and will feel pleasure inside it as we aspire toward everything away from ourselves, toward bestowal to the neighbor and the Creator. In our work, every step is measured by our intention. Each new action demands a new, sharper intention. Actions themselves may take various forms, but the key is to know what outcome I wish to receive as a result of my efforts. Here is where we have to measure ourselves: How much do I care for the reward and what kind of reward is it? We speak not about corporeal rewards, but of more exalted values of a spiritual nature although they may have different vectors: for the sake of reception or for the sake of bestowal. If a person demands a reward for his work in his Kli, then his intention is aimed at reception. He wants to feel, understand, attain, ascend, and so on. In other words, it doesn’t matter what exactly my desire is. If the goal is related to me and examination is taking place in my desires, then my calculation, despite being spiritual, is still egoistic. Even if I wish to attain brotherly love, love of others, and love for the Creator, I still need to dig deeper and examine how I define these terms: What is their content, impurity or sanctity? Thus, essentially, a person examines the results of his work: either in his own Kli or in the Creator. All such verifications may be accomplished only if we are doing genuine work, meaning revealing the Creator in the group. The love of friends serves as some type of purifier for intentions and desires, with the help of which I get purified from egoistic calculation and don’t err in my examination of who I am, what the group is, and to what degree I am loyal to it and not to myself. As a result, I realize that I am incapable of even the tiniest act of bestowal. It is beyond my capacity. So, I turn to the group because the friends gave me a sensation of Arvut (mutual guarantee) and they can provide me with the strength to bestow. The greatness of the friends and the group supply the fuel to me, which continues up to a certain level, until I build my Kli. Having completed its correction, I wish to use it, and that’s when in the group I discover the Creator, to whom I had initially aspired. Only now, I turn to Him together with the friends, from our common desire, to ask for the force of faith. Thereby, we attain adhesion with Him. Question: What does adhesion with the Creator imply? Answer: Adhesion is a great correction, unification on the basis of equivalence of properties or “form.” We don’t need to change the substance of the will to receive itself. Yet, this substance has an egoistic form (intention) that is regarded as “evil,” opposite to the Creator. The will to receive in itself isn’t considered bad and opposite to the Creator, just as the still, vegetative, and animate nature aren’t considered bad and opposite to the Creator. And until a person gets to feel that he is opposite to the Creator, he isn’t considered to have the “evil inclination” either. First, it is necessary to recognize that your intention or the “form” of desire is opposite to the Creator. If not, a person has no evil: He simply acts in accord with his instincts. In Kabbalah, evil is defined as a property opposite to the Creator, the Good, or the Light. A person can sense evil only when the properties of goodness, connection, and love are revealed to him, and he can see himself as opposite to the Creator. At that point, a person becomes a “human,” no matter how bad this human is at the moment. And this occurs only with the studying of the wisdom of Kabbalah. Before then, there is nothing to correct in a person and in all egoists of the world. It isn’t the form which requires correction. Only the breach between me and the Creator demands correction. I must transform the form that is opposite to the Creator to a good one, similar to Him. And when we become equal with Him in mutual bestowal, then, as it is written, we attain connection called “adhesion” (Dvekut). This inner work (revelation of evil or brokenness and its correction) occurs solely by way of the Light that is drawn during the group studying of Kabbalah. In one of his incarnations (Gilgulim), a person suddenly feels a “shot” into the heart, a “spark” that draws him to some new, non-materialistic life. He wants to rise above the mundane, earthly existence and comes to the studies and the group. As time progresses, he begins to feel how inadequate he is to bestowal. From that moment on, he realizes that his nature is opposite to the Creator. Only then can it be said that the “awareness of his evil” has surfaced in him. But people usually think that “evil” means being just a bad person in the society, and not being against everybody’s unity with the Creator. Kabbalah doesn’t correct the earthly evil (not helping an old lady cross the street or not giving money to the beggars). This evil cannot be corrected at all; it only keeps growing untill we get rid of the spiritual evil.